Islamabad: The Millennium Universal College (TMUC) in collaboration with University of Hertfordshire hosted an invigorating symposium to address the issue “Employability or Entrepreneurship, what matters more?” The theme was inspired by the need to direct university students about taking the best possible route for themselves and to understand the intricacies of choosing either one. The symposium featured a high-level exchange of ideas among academicians and business executives and specialists. TMUC has been committed to holding such symposiums consistently; establishing academia-industry sustainable partnerships, that will bring forth successful results. The ideas and insights certainly sparked a lively debate among all those in attendance. The panel discussion provided an engaging platform for academia-industry alliance where academia representatives from both universities engaged in a dialogue to guide TMUC students about choosing professional pathways in order to succeed in the global working environment. Focal points of the debate included sharing of entrepreneurship knowledge and to come up with inclusive solutions to enhance students’ resilience to adapt to the international business world. The symposium was also part of the GEW (Global Entrepreneurship Week-) that is held every November, to inspire millions to engage in entrepreneurial activity while connecting them to potential collaborators, mentors and even investors. Professor Damian Ward- Dean of Hertfordshire Business School who was especially here from UK for the event, enlightened students how the economic landscape has changed over the years and the most important resources are now people and knowledge. Dr. Ather Osama, the Founder of Pakistan Innovation Foundation gave the keynote inspiring address on how we must always find the way forward in spite of any hindrance and believe in their passion and pursue it with resilience. 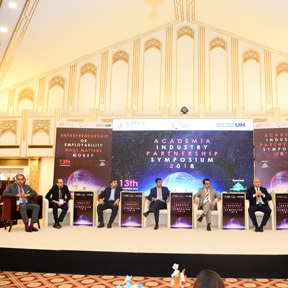 TMUC, at the symposium hosted a diversified mix of renowned speakers that included Ambassador Shahid Kamal, Mir Muhammad Ali Khan- CEO AMZ , Mr. Tarek Hamdy- CEO Eighteen Mr. Zaheer Mehdi – Vice President Engro Corporation and ACCA Market Head (Business Development) Asad Hameed, along with CEO TMUC Chaudhry Faisal Mushtaq. All of them facilitated conversations that will bring about positive, sustainable change to the students’ approach towards employability & entrepreneurship. The panel discussion was moderated by seasoned anchor-person Faisal Rehman and proved to be immensely beneficial for the participating students from the knowledge imparted by all of the guest speakers.